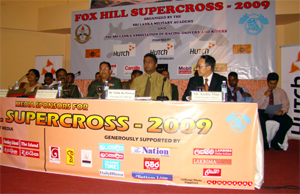 Foxhill supercross 2009 was held on 17 & 418 April in diyathalawa with the participation of Srilankas highest ranked professional drivers and riders. This event was successfully organized by Srilanka Army with SLADAR. One of the event highlight was the Under 10 Motor cycle event. for this event more than 25 of srilanka's future riding stars participated. Many of the spectators said that this is an excellent idea and were surprise to see so many future prospects. All the participants were awarded prices by the SL ARMY. 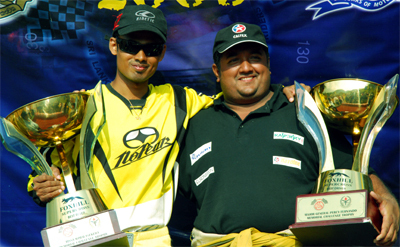 Aravinda premadasa was awarded the champion Driver while gayan sandaruwan was awarded champion rider as in privies years. The Sri Lanka Military Academy � the prestigious military training institution located in the small garrison town called Diyatalawa amidst beautiful hillocks and valleys with an ever-blessed salubrious climate is totally committed to train young gallant Officer Cadets, the true patriots of the nation who have dedicated their beautiful youthfulness in the name of country�s safety and territorial integrity. It is they who give junior leadership to the warfront. In recognizing the need to sharpen the leadership traits of these young trainees, the lady and gentlemen Officer Cadets, with academic wit to merge with military professionalism a bachelor�s degree in military science has been introduced in collaboration with the Sabaragamuwa University of Sri Lanka to the military component. For successful implementation, the two programmes are intertwined and the Academy needs a huge infrastructure and administrative support. In 1993 a fantastic source to generate the much-needed funds was originated: �Fox Hill Supercross�. Ever since, the limited funds have largely been used to uplift the standards of this prestigious institution. The Sri Lanka Association of Racing Driver and Riders works hand in hand with the Academy to ensure the smooth as well as successful conduct of races each year. The entire country ought to be grateful to the event because most of the essential facilities the trainees enjoy today have been materialized through Fox Hill funding � language laboratory, computer laboratory, swimming pool and gymnasium are just a few. The Academy has no hesitation in expressing their gratitude to everyone who has contributed in numerous ways, from spectators to sponsors. Some of the proposed projects for future implementation are a fully-fledged classroom complex and billeting facilities for trainees. We are proud that the SLMA can majestically stand on a par with other military academies in the region of South Asia today. The Fox Hill track, built to international standards nestles amidst a vast pine plantation on a mountainous terrain. It is unique and is the fastest and the greatest in the island with a track distance of two kilometers. The track is constructed in such a way that it provides spectators a guaranteed full view of ninety per cent of the action, thrill and excitement which is not possible in any other local racing track. This April holiday season is awaiting to offer thirteen motor car events and seventeen motorcycle events for sports enthusiasts from all over the country. Fox Hill Supercross has been marching forward in leaps and bounds for the last sixteen years and the SLMA and SLARDAR owe largely to the sponsors, drivers and riders and enthusiastic sports fans. We have been able to conduct the races for the seventeenth successive year due to the strong relationship between the Academy, SLARDAR and the media. Visit to Find More than 500 Professional Photos of Foxhill Supercross 2009. Exclusively by Kaputa Racing.